Doctors and officials have long complained that the country's state-funded health system suffers from a lack of financing, including for medical research, and public satisfaction with the free care is low. Health Minister Veronika Skvortsova told regional health authorities on Wednesday that instead of travelling either abroad or to Moscow and St. Petersburg for medical care as many of them do, they should seek care locally. “Otherwise it will be impossible to raise people's opinion of national health care,” Skvortsova said via video link from Moscow, Interfax reported. On the conference call, Skvortsova also said Russia currently had 40,000 too few doctors, although she promised that the shortfall could be made up within three to four years. Buziashvili said that out of the roughly 50 new drugs that appear every year, none are produced in Russia, a statistic he took as indicative of the backwardness of Russia's pharmaceutical industry. In a September survey by the Levada Center, 15 percent of respondents said they were satisfied with the state of the country's health-care system, while 61 percent said they were dissatisfied. Concerns over Russia's reliance on Western medical expertise come as the country's medical tourism sector continues to expand. According to data from the Russian Association of Tour Operators, roughly 70,000 well-to-do Russians travel abroad every year for medical reasons, spending about $1 billion outside the country, and experts say these figures are on the rise. 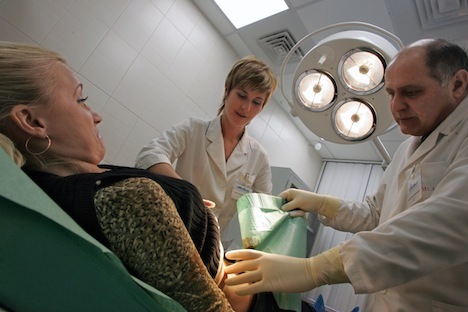 Russians typically prefer clinics in Germany, Israel, France and Switzerland, while medical tourism to Eastern European countries is also growing, the association said. As a reflection of the vogue for overseas health care — even among prominent figures considered symbols of national pride — Bolshoi Ballet artistic director Sergei Filin is receiving specialist eye treatment in Aachen, Germany, as he continues his recovery from an acid attack outside his Moscow home in mid-January. Health specialists told The Moscow Times that a lack of trust in local doctors was a key factor motivating Russians to attend foreign medical centres. “In Russia, doctors can be both coarse and paternalistic. They don't explain the course of medicine they're prescribing and behave as if the patient should just sit there and listen,” said Anya Sarang, a health activist who heads the Andrei Rylkov Foundation for Health and Social Justice, a Moscow-based NGO. “For this reason, being treated abroad can be attractive. There at least you pay your money and you're treated with respect,” said Sarang, stressing that only Russia's richest can allow themselves the luxury of overseas medical trips. Sergei Kalashnikov, chairman of the State Duma's Public Health Committee, said other psychological factors can also drive Russians to seek treatment abroad. “Western clinics don't only include nice wards, cleanliness and so on. Their medical personnel are also highly attentive to patients, who feel like the clinic's main focus is their well-being,” he said by phone, adding that foreign centres offer a “complete rehabilitation package” not offered by Russian clinics. Sarang, citing experience in her area of expertise — patients with HIV, tuberculosis and hepatitis — said medicines from countries such as India are seen as preferable to their Russian equivalents, since they conform to World Health Organization standards, which are often ignored in Russia. Kalashnikov said officials were aware of the country's reliance on foreign-made medicines and pointed to the government's Pharma 2020 programme as evidence that progress was being made. The programme aims for at least 75 percent of the drugs used by Russian patients to be produced domestically seven years from now, even if they are invented abroad. “It will take time for the results of the program to become apparent,” he cautioned, explaining that inventing and producing highly effective medicine takes an average of 10 years and costs at least $1 billion. “For now, our task is to facilitate access to the Russian market of highly effective Western-invented medicines,” Kalashnikov said.